I recently picked up a woodworking book that really hits the spot. 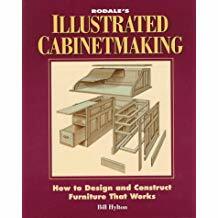 Rodale’s “Illustrated Cabinetmaking, How to Design and Construct Furniture That Works,” by Bill Hylton. It’s not a new book. In fact it has been around a good while. But it is a very useful encyclopedia of what it takes to build quality goods. This book is about 50% of what the “advanced novice” like myself needs. I call myself an “advanced novice” for some important reasons. I know how to cut things right, how to make things fit, and how to give them a good finish. What I have not done is apply these principles to making finer pieces. I’ve built some good pieces, things that people are happy with. But fine pieces, I’m not there yet. That’s what sets this book apart. I’ve read a number of books where the projects all look like Arts and Crafts projects. They are simple and look like they are meant for the house that has chosen a rural design. That’s ok if that’s the only style that people want. And it is also ok if that’s the only style you want to develop your skills in building. But if you want to broaden your sills and do Federal or Shaker or Empire or some other style then those books will limit your development. Illustrated Cabinetmaking begins with the basics. It starts with a description of the components of a piece of furniture. It then proceeds to present some history, the styles that have been popular through the last three centuries. This will give you a snapshot of what you might face in your design planning. After that is a section on the wood. This is probably one of the most critical pieces and is not to be ignored. If you do you run the risk of having a nice-looking piece develop its own miniature version of the Grand Canyon on some very visible surface or joint. And joints is what it’s all about. The next section covers a multitude of joints. Many of them were completely new to me, such as the full blind dovetail. But of course with the quantity of joints that are presented there is no space for teaching you how to construct each joint. In the days before the Internet and WWW that would have been one more significant challenge. But today just go to YouTube and there is probably a tutorial out there. What do you get after you learn joints? You get to make things. But when you think about it what all woodworking projects entail is components or subassemblies. There are frame and tops and drawers and legs or all sorts. You will find the door and drawer sections to be pretty thorough. After subassemblies comes projects. As I said before these aren’t simple Arts and Crafts style projects. They will push you in terms of technique and style, though I will add that for a project with a Queen Ann leg I would personally just go buy the legs instead of making them by hand. But that’s me. The sideboard buffet project has a beautiful Arts and Crafts styling while the Bowfront credenza has that smooth continental appeal. It should be noted that these projects are not complete plans. But each has a reference for obtaining the plans. Many of them are relatively inexpensive. For instance, the Bowfront Credenza (“Measured Shop Drawings for American Furniture” by Thomas Moser) is only about $2 on Amazon. Oh, and it should be noted that some of the projects are as utilitarian as they are stylish. Yes, you do get instruction in building a quality kitchen base cabinet. But let’s face it – there is a good living in building quality kitchen cabinets. A really living if you do an excellent job and present yourself well. Like all furniture building success is about one thing. And if you don’t know what that is I’m not going to tell you. What? Of course you need to know. It’s the same thing that applies to all jobs and skills. It’s your attention to detail. Never forget it. Keep it in the front of your thoughts and make it your first principle. That’s how you make quality products, whether for yourself or for your own home. This book is your encyclopedia for that course.